I spent the first day of spring readying for the return of winter. A storm was predicted for the Boston area. Leaves had piled up in the corner of the driveway where, miraculously, the wind had tucked them into a tidy pile. It was breezy, but not cold—the ideal day to don a hat, fleece jacket and gardening gloves to collect leaves that take flight from the forested back hill all winter long. I have a special method—using a lightweight, concave snow shovel, I scooped up the crinkled, thin-as-paper American Beech leaves. I worked on and off for two hours, enjoying the rhythm of lift and fill until I had two barrels full to place on the curb. Gratefully, in my town, garden waste recycling pickup began the very next day. I took breaks, walking the winding, flag stone path of my front garden, searching out signs of new growth. I noted forsythia and lilac buds in swell, pointy lily stalks in stretch. Six patches of daffodils, many in full bloom, stood tall. I worried how they would fare if the snow was bold, icy, and fierce. I took pictures to hold the moments of their fresh growth. Daffodils launch spring and usually display their yellow and frilly petals for two to three weeks. What hubris, to think that we were home clear, that winter was spent, thanks to el-nino’s seductive warming. The next morning, I awakened to a thick, white crystal coating on the myriad of trees and shrubs surrounding my home. So focused on worry for my plantings, I had forgotten the sheer beauty and surprise of a white-bright, morning landscape. The snow was light and wet enough to cover every surface. Feathery-branched trees and gracefully shaped shrubs sparkled while I, grateful for their splendor, shimmered with delight. All afternoon, spring’s rising sun dissolved the winter-scape and melted my worry. By dusk, I was certain the daffodils would survive. In three days time, the garden returned to its spring appearance, only more so. The nubile plants stood taller, appeared greener. It turns out— a fact I learned from my WBZ-Boston weatherman— that snow contains abundant amounts of nitrogen, an element which enriches growth. Curious about the details, I learned from the Farm Journal site that as precipitation falls through the atmosphere, it collects atmospheric nitrogen. When snow collects on thawed soil, it melts slowly and allows a gradual release into the soil. A natural conversion of elements takes place. Since the ground is already thawed, the moisture and nitrogen seep deeply into the soil, adding to the total nitrogen content. I am grateful for needless worry, the gift of a nitrogen enriched soil, and the joy of spring daffodils standing tall and refreshed. 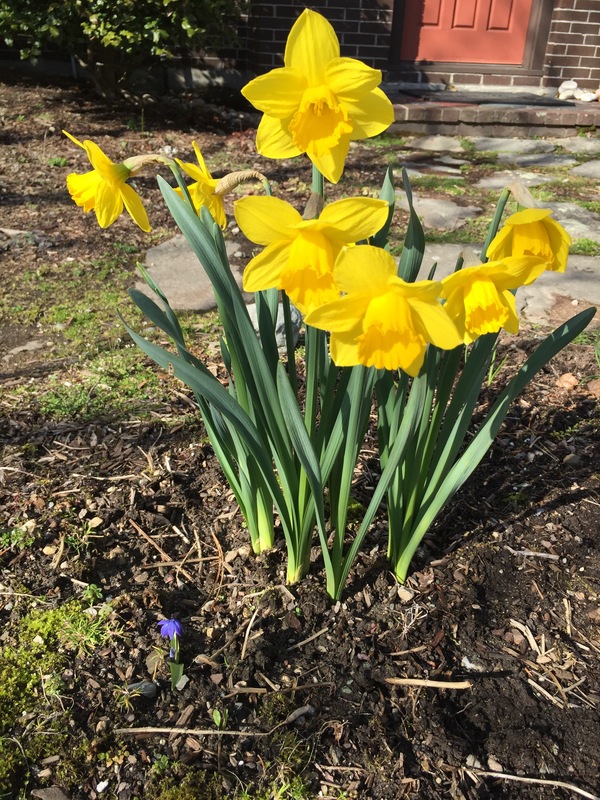 This entry was posted in Happiness, Mindfulness, Nature, Sustainability and tagged daffodils, el nino, gratitude reflection, nitrogen & snow, spring snow on March 28, 2016 by fayewriter. What a hopeful and beautifully written essay to receive on a grey and rainy Monday morning! I began to envision tinges of a yellow toned landscape as I set up my art studio to paint. The grey evolved into a yellow-grey, even for a few moments, and this brought me joy! It’s nice to know that the snow became the daffodils’ friend. The strokes that I often worry about the most usually add the magic to my painting! Thank you, Bev, for your artistic comments. How intriguing that you worry about the most unusual! Your post was a lovely reminder to be grateful for all things, including snow on an early spring day. Though wet and dreary this morning, I was cheered by the yellow daffodils and bright green grass. Thank you for your continued Monday gratitude posts. Heather, thank you for commenting and yes, the yellow daffodils on a rainy day buoy my spirit as well! I was blown away when I heard my favorite weatherman’s report…and had to know more. If the ground had been frozen, there would have been a run off rather than a deep adsorption. The fact that there had been so much warming the days prior helped with rapid absorption. The snowy day before, my plants were drooping and they perked right up after! Grateful, Indeed. Thanks for sentence comment…. I like the image of the plants’ seeming to stretch taller and look greener–after the onslaught of that not-so-worrisome snowfall. And the story of how the snow delivers nutrients–without any investment by the gardener! Free dividends, you might say. Lovely, and entirely cheering. Rosemary, yes, dividends from the sky… and yes, they did stand taller! Such a fun experience… every planting seemed refreshed.